Alcohol is a powerful substance which should be consumed with moderation. It can help people relax, get rid of stress, and unwind after a long and potentially stressful day at work. However, too much of a good thing can become a bad thing and unfortunately, many people start to drink too much alcohol on a regular basis. There are several signs of alcoholism which can be easily spotted and can definitely tell if a person is abusing alcohol or not. These can be physical signs of alcoholism, but not limited to that. How much is enough? Well, this depends on a multitude of factors such as gender, age, tolerance, whether a person has had something to eat before or not, even genetics. Generally speaking, having a few beers or a couple of glasses of wine with friends every week shouldn’t be a big problem and constitute a definition of alcoholism. This is a common way of just having fun and relaxing, not to mention that red wine, for example, can have great health benefits for one’s heart if it is consumed in moderation. However, people who drink at least a couple of beers every day (or a full bottle of wine) are definitely abusing this substance. Signs of alcohol abuse will quickly appear and can cause major problems in all aspects of life. On the other hand, it would have been a big question how to spot an alcoholic without these signs. What are the warning signs of alcohol abuse? What are the physical signs of alcoholism? What are the 15 symptoms of alcoholism? 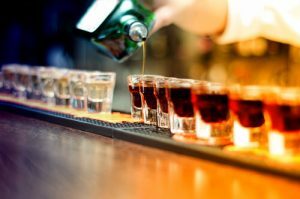 Is It Possible to Quit Drinking and Eliminate Alcohol Addiction Altogether? One of the most common signs of alcohol addiction is having a blackout as a result of drinking too much. Blacking out refers to the fact that one can have serious difficulties remembering people, actions or conversations with friends/relatives. This is a dangerous state of mind and having regular blackouts is definitely a serious sign of alcoholism. If you or your loved one suffer from alcohol addiction and need professional help to quit drinking, call (866)-520-2708 today and let one of our specialists help you. Our therapists can help people eliminate alcoholism and live a happy, healthy life again! There are many alcoholics who try to stop drinking but fail for various reasons. Luckily, there are many things which can be done to help alcohol addicts reclaim their lives and get rid of alcohol abuse completely. Not being able to say no to alcohol is definitely one of the most common warning signs of alcoholism, but the sooner alcoholics get professional help, the easier the healing process will be. As with any other substance, the body tends to easily get used to certain chemical compounds or drugs, so the effects are less intense. People who drink regularly and have already started to show physical signs of alcoholism will eventually build alcohol tolerance. As a result, alcoholic people will try to increase the dose (have more drinks) to get the same “high”. Developing alcohol tolerance is a surefire sign of alcohol abuse. People who tend to drink too much alcohol on a regular basis will definitely become less and less able to manage their responsibilities and duties. This is one of the most common early signs of alcoholism and it is caused by the fact that the person in question doesn’t have a very stable state of mind to deal with life issues. Alcohol addicts could either reject responsibilities or avoid them altogether. This happens because alcohol abusers spend a lot of time in alcohol-related activities such as drinking, having hangovers, etc. Obviously, this can lead to serious problems in the long run. It is true that alcohol can help people relax a bit and get rid of stress, but only if it is consumed in very small quantities. If someone abuses this substance, it will only aggravate the problem, not make one’s life easier. Alcoholics develop the bad habit of drinking when stressed or have to face a difficult situation. Even worse, alcoholics don’t stop at a drink or two but continue to drink until a blackout occurs. Among alcoholic behavior patterns, drinking under stress is one of the most common. These people do so to try to feel relaxed or forget about problems, but this never happens. People who abuse alcohol tend to make this substance the central element of life. For example, alcoholics tend to avoid people or social situations where alcohol consumption is prohibited. Most of the times, alcohol addicts look for the company of those who share the same bad habit and this involves drinking too much on a regular basis. This will quickly lead to common physical signs of alcohol abuse such as flushed skin, bad breath, etc. Another way alcoholics tend to make this substance their central element of life is by spending a lot of money on alcohol (even borrowing or getting seriously in debt to pay for drinks), spending a lot of time recovering from binge drinking (having hangovers, etc), going to great lengths to obtain certain types of alcoholic beverages, etc. One of the first signs of alcohol abuse is that alcoholics tend not to acknowledge this problem and start to rationalize the bad behavior. Drinking too much will definitely lead to physical signs of alcohol abuse and alcoholics usually ignore the symptoms or try to convince others that everything is under control. Alcohol abusers also complain that their friends and relatives are exaggerating when pointing out this bad habit. There are other ways alcoholics tend to deny the issue and that is by blaming others for various problems. In some cases, alcoholics point out a stressful job or relationship as the source for their bad drinking habits. Alcoholics also try to rationalize this behavior by finding “excuses” to get drunk such as a going to a friend’s birthday party, attending a live event, etc. People who abuse alcohol usually tend to feel guilty for it and try to get rid of this feeling by hiding from others to indulge in bad drinking habits. One of the most popular signs of alcohol dependence is to drink alone, drink in the dark, and lie about how much one drinks on a regular basis. Alcoholics might even try to buy alcohol from different places each time to prevent people from getting suspicious about these habits. Lying about alcohol consumption is definitely an important sign that one is starting to abuse this substance. Binge drinking is very common among teenagers, but alcoholics of all ages can suffer from it. This basically means that one drinks a great amount of alcohol in a short period of time (usually to get that “high” faster). The exact quantity varies, but it usually means drinking two or more beers per hour or 3-4 glasses of wine per hour. This can result in addiction to beer or wine. This isn’t only one of the most common signs of an alcohol problem, but it is also very dangerous for one’s health because the liver cannot process more than a glass of wine per hour. Alcohol abusers tend to have a hard time gauging the potential consequences of this bad habit and usually drink before engaging in various situations such as driving or operating heavy machinery. Such a habit becomes very dangerous and this is one of the most popular symptoms of alcoholism. It is very common for alcoholics to also drink against a doctor’s recommendation. This happens because alcohol addicts usually don’t care about the consequences this substance has on their health. Most alcohol abusers might even drink knowing that it can worsen a particular health condition such as diabetes or liver problem. Among alcoholism symptoms, drinking before going to work or driving is the most obvious sign of alcohol abuse and something must be done as soon as possible to prevent tragedies and unfortunate events. In worst cases, alcoholics tend to steal money just to sustain this bad habit. One of the most common alcohol abuse symptoms is developing physical signs as a result of drinking too much. These can be very varied and include premature aging signs such as wrinkles, flushed skin, fragile nails, and hair, having an alcohol breath and even forgetting to have a shower for days or even weeks. Since alcohol is a powerful substance, drinking too much can lead to other similar physical symptoms of alcoholism such as having stomach and teeth issues. Some people start to get broken facial capillaries, get injured as a result of drinking too much (and potentially falling on the ground) and even getting yellow eyes. Among other symptoms of alcohol abuse, starting to lose interest in different types of activities which can be considered fun to do such as hobbies. When a person who drinks regularly doesn’t have sufficient time to engage in pleasant activities, considers hobbies to be a waste of time or simply doesn’t care about favorite activities anymore, this is a surefire sign of alcoholism. Alcohol symptoms can be very varied and include having poor performance at different school activities or at work. For example, alcoholics tend to become less productive, pay less attention to work/study and spend more time procrastinating or taking breaks. This might happen because too much alcohol causes hangovers which seriously reduce productivity. As a result of consuming too much alcohol, certain physiological symptoms of alcoholism will appear and work colleagues or teachers will definitely start to notice this. Alcoholics might have troubles getting to work or school on a regular basis and might eventually get poor grades or low-performance feedback which in turn will worsen the situation. Alcohol abuses also have a hard time focusing for long stretches of time. When one engages in excessive drinking, friends or relatives will definitely notice and try to help or obtain an explanation. Some alcoholics prefer to be left alone which can lead to serious relationship issues. Among signs and symptoms of alcoholism, having constant arguments with relatives and loved ones is definitely an important factor. Some persons who abuse alcohol can also become dangerous and this can manifest by engaging in violent activities or being extremely aggressive with the surrounding people. 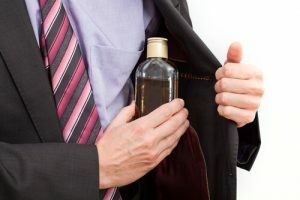 Alcoholics might accuse others of being too intrusive and might choose to spend more time isolated to continue drinking. In many cases, alcoholics tend to have poor-quality relationships with parents, friends, and/or spouse. Getting rid of alcohol abuse is not very easy as one has to fight withdrawal symptoms which include anxiety, tremors, fatigue, headaches, lack of appetite and more. These alcohol addiction symptoms appear as a result of stopping drinking alcohol and can last for several days, weeks or even months, as the body gradually adjusts to a new lifestyle. Although facing the withdrawal symptoms is difficult at first, it is an important step in the recovery process and it must be accepted as it is. Yes, it is entirely possible to get rid of excessive alcohol consumption. However, it requires dedication from the alcoholic’ side and help from his relatives/friends. Professional help is so important in this case because not only the physical aspect of this bad habit must be treated, but also the psychological one. The treatment options include inpatient and outpatient programs. Alcoholics need to find better habits to engage in and find inspiration and motivation to pursue an alcohol-free life. That’s where professional therapists can step in and instill a desire to live healthy again, helping recovering patients to start a brand new and better life! Treatment of alcoholism is possible at any age and any stage of addiction. Choose the alcohol addiction treatment center and start a new life today!